Today MP4 is quite a common video format used in either online streaming or offline watching. Lots of devices set MP4 as their basic supported format. Thus if you want to convert video files to MP4, it is really a smart choice. But how can you convert video to MP4, or even other video/audio formats? Sometimes if you don’t have much time to find a converter, or you find it difficult to find one, you may easily be trapped by websites that parades themselves as the best, easy and free online converter but provides bad output video quality or virus. You’d even have to connect internet whenever you need to convert via an online converter. We understand the risks you may experience and thereby, we offer a reliable video converter to help you out. Compatible with almost all major video streaming online platform. 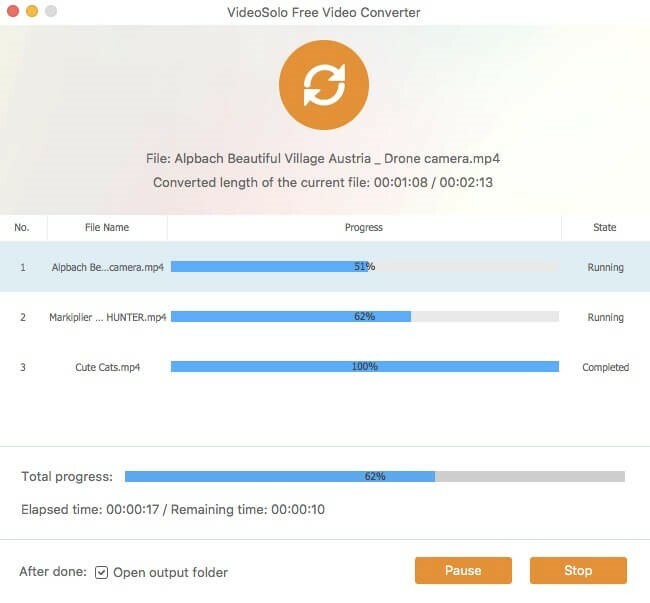 What Can VideoSolo Free Video Converter Do? VideoSolo Free Video Converter is a reliable and powerful converter among all the video converters we have ever seen. Its outstanding features will strongly impress you on your first try. Below are some of its features we have mentioned. After reading them, you will know soon why we like this program. And you can make a comparison and contrast with other converters that you have used. For Windows​ | For Mac. With VideoSolo Free Video Converter, you can not only convert video to MP4 format but also MOV, AVI, MKV, FLV and more formats. For audio, you can extract it to MP3, AAC, AC3, M4B, MP2, etc. The various format options empower you to make any conversion easily. By the way, for DVD conversion, you may need an advanced converter, VideoSolo Free Video Converter Ultimate. This is especially for the higher requirement users. It is no concern whether if your current device is iPod, iPhone, Samsung, Sony, LG or other mobile phones and portable devices. The program supports you to playback converted videos on all these devices. A design to save your time when converting is “Batch Video/Audio Conversion”. Particularly, we have to highlight that you can either apply the same output format to several videos or convert videos to various formats at the same time. Sometimes you may need to combine several video clips into one and customize your own video. This program provides such merging option, which is so convenient that besides converting videos, you can also make them together via the same program. 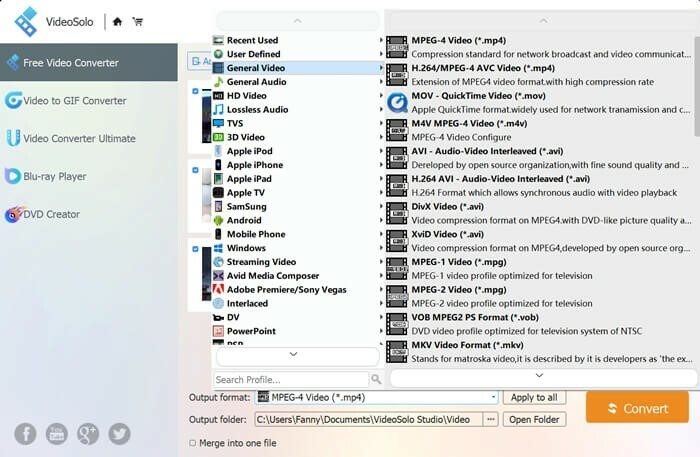 The program is developed by professional IT group, who has been working for video/audio converter for a long time. And you can search the program’s homepage to see more answers about its technology question, customer service, feedback… So you don’t need to worry about any problem when using it. The best thing is, this free converter can be updated with no charge. Every time the converter gets an update, you can freely own a new one at the same time. Step 1. Start the program and add video file or folder. 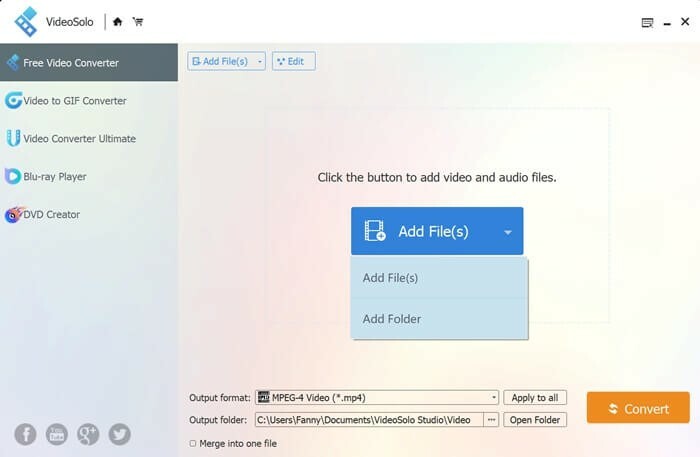 You can begin by clicking on the button step by step or use a simple way, drag and drop the video file on the interface. The program will soon upload your files, just be ready to the next step. Step 2. Select output video format by clicking on the lower side of the interface “Output format”. As MP4 belongs to “General video” format, so just like the picture below, you can easily find this format. On the situation if your converted output format is unusual, you may have to find it with difficulty, so you can type its name and search. Step 3. You’d better check your previous steps now if you have lots of video files to convert. And next convert the video file to your targeted format by clicking on the “Convert” button. The final step is finished now. You can choose to convert all the videos at the same time. The conversion won’t take you much time. It depends on your imported file size. In summary, VideoSolo Free Video Converter is very powerful and simple. That is the first impression when we used it on our computer. Actually, with this converter, our work and life entertainment in enjoying video/audio will change into a more convenient and better way, so that we can playback any format video on various devices or stream video over the internet without format limits. Having a useful program like this is necessary for us to deal with format incompatible problems at any time. Therefore, why not download and try this helpful, free video converter.